Design for Life Ltd is a small design and editorial company. 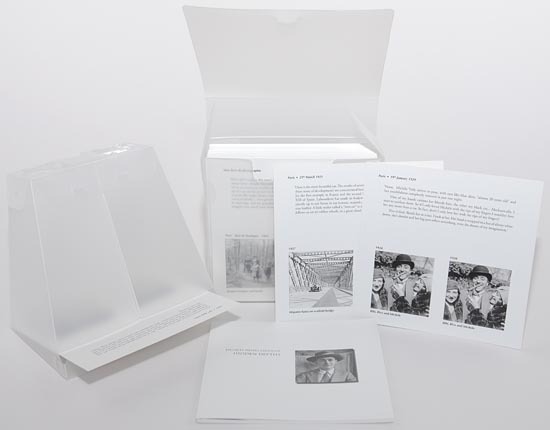 We are currently offering a highly collectable set of stereo (3D or 3-dimensional) photographs by the great French photographer Jacques Henri Lartigue, Hidden Depths, and a compatible stereo viewer. More information is provided below, and an extended interview with me in which I talk about Design for Life and Hidden Depths can be found on Henri Peyre's wonderful site, links shown on the right. Lartigue was born in 1894 and began taking photographs when he was just six years old. He continued for nearly a century, in the process filling 120 huge photograph albums documenting his own life and that of his family and friends. Made famous by Richard Avedon in 1963, many of Lartigue's early photographs have been endlessly recycled since. You can find out more about Lartigue here. Despite his popularity, few people know that many of Lartigue's greatest photographs were taken in stereo. Also known as 3D, this technique allows a photograph to show depth as well as the height and width of a conventional photograph. This means that backgrounds look farther away while, for instance, people in the foreground appear distinctly closer. You can find out more about stereo here. These wonderful images have never before been available in stereo. Now Design for Life offers a set of 100 stereo photographs in a limited edition of 2,000 copies each individually numbered, and available with a custom viewer designed to show the photographs to best advantage. 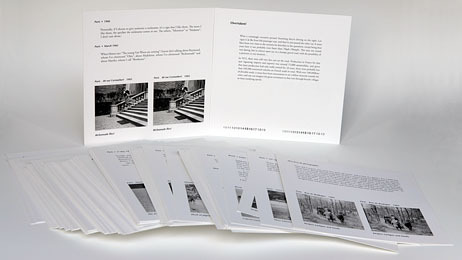 The 100 cards in the set each have a stereo photograph in the original format, a quotation from Lartigue, and a commentary on the back of the card. In addition there is a 32 page bound booklet with a biography of Lartigue and an explanation of stereo photography and its place in his oeuvre. The photographs have been carefully chosen from the Lartigue archive of over 5,000 stereos to show some of his best-known photographs (although never seen in stereo) and also some that have never been published elsewhere. They have all been scanned from the original negatives to ensure the best possible quality. These stereo images take you into the scene being photographed, giving a sensation of actually being there that cannot be captured in any other way. Lartigue himself regarded the stereos as very special, and when interviewed on the subject, expressed great regret that they had only ever been published in their 2D form. The quality of production is superlative throughout. The cards are offset litho printed using 400lpi stochastic screens, with tritone separations for the very highest fidelity, on heavy 300gsm card. Hidden Depths is a limited edition of just 2,000 individually numbered copies, offering a unique chance to own photographs that have previously only ever been seen by Lartigue, his immediate family and a handful of privileged researchers at the Lartigue archive in Paris. Hidden Depths has already received rave reviews - read a few here: reviews and see also the interviews in the links. The latest Mark III version of this stereoscope has further enhancements. 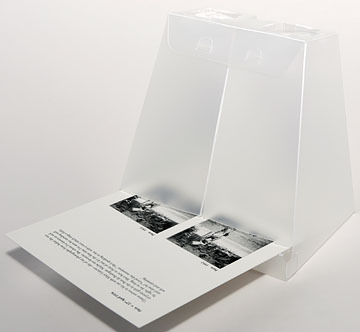 In particular, the wider card slot allows the use of standard postcard size (6 x 4" or 15 x 10cm) prints. It thus makes an ideal viewer for Loreo or similar stereo prints. In addition it is better designed and built, uses a higher grade of polypropylene, giving it a real 'precision engineered' feel, and holds the lenses more firmly than previous versions. Made of translucent polypropylene, it has optical grade acrylic prismatic lenses giving a quality of image that is quite exceptional for a viewer in this class. There's more information on the stereoscope here, including details of an example one enthusiast, Ron Labbe, has modified himself. I tell everyone that it's crucial to get as much light as possible onto the image - Ron's leaving nothing to chance! I've just added this handy little lorgnette-style viewer. Made to Einsteinian principles - "As simple as possible, but no simpler" - this is the best viewer for the price you'll find anywhere. It's ideal for viewing book or magazine illustrations, or just to pop in your pocket if you're visiting a photo fair. It consists of a pair of the same high quality prismatic acrylic lenses found in our polypropylene viewer, mounted in a foam surround, which means it's robust, lightweight, low cost, and easily cleaned should it ever prove necessary. Andreas Bohlender (find him here) has made a great little video showing a Design for Life stereoscope nonchalantly assembling itself (they don't all do that, luckily for our store room). The video also gives an elegant 2 minute summary of the whole Hidden Depths package so well worth a view. Thanks Andreas - keep up the good work! We now have only around 100 copies of Hidden Depths left and it will not be reprinted, so if you want to be sure of a copy, best to buy it soon. It makes a great present! For Dutch stereo fans there's a good review of Hidden Depths by Holly Moors here.